Smiling Planet finally came out with bowls! I’ve been waiting for this for a while. I love this company. All their products are BPA, phthalate, toxic ink free yet dishwasher safe. I love their aesthetic design and their industrial design. The plates have rims so P can catch that kernel of corn on her spoon easily. The bowls are also lovely. From a distance you’d think it’s an adult porcelain white bowl. Inside at the bottom is a design. It actually gets P to finish what she’s eating because there’s a mermaid or peace sign she wants to see. If you’re looking to have a variety of dishes in multi crazy colors for $9.99/a six pack, then these may not be for you. They’re $14 a piece. I’d rather spend more for quality over quantity. They last forever, look good and keep P safe while giving her a loving message. Plus they make me feel happy when I set the table. 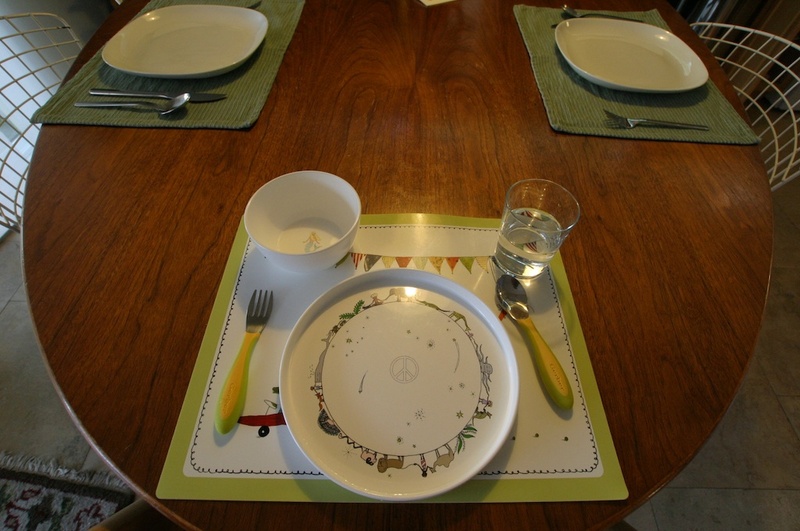 It’s the little things that make my day….like matching placemat and silverware. Crazy, I know! Next Next post: Same Place. Different Time.